I recently had the chance to hang out with some fellow bloggers down in Alabama. I had created a couple of recipes that I wanted us all to test out and tweak and photograph. 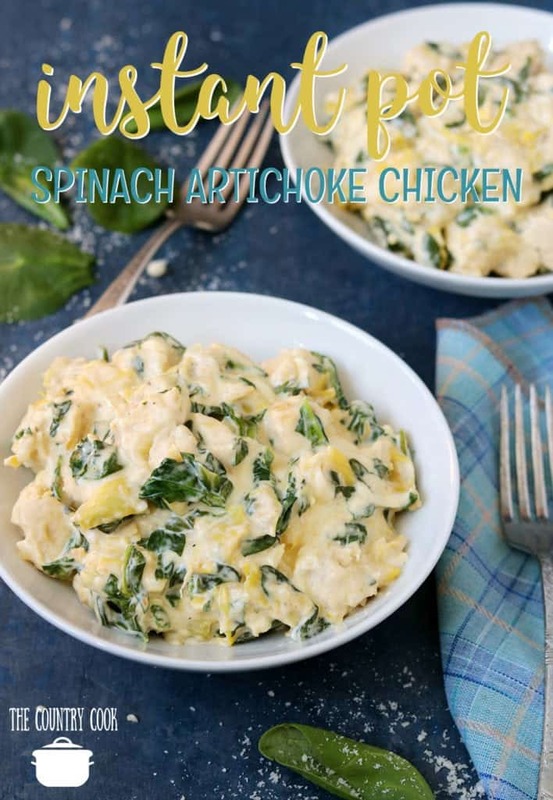 So you’ll be seeing this recipe on all of their sites too! 🙂 Thankfully, Stacey from Southern Bite has a beautiful test kitchen for just that purpose. 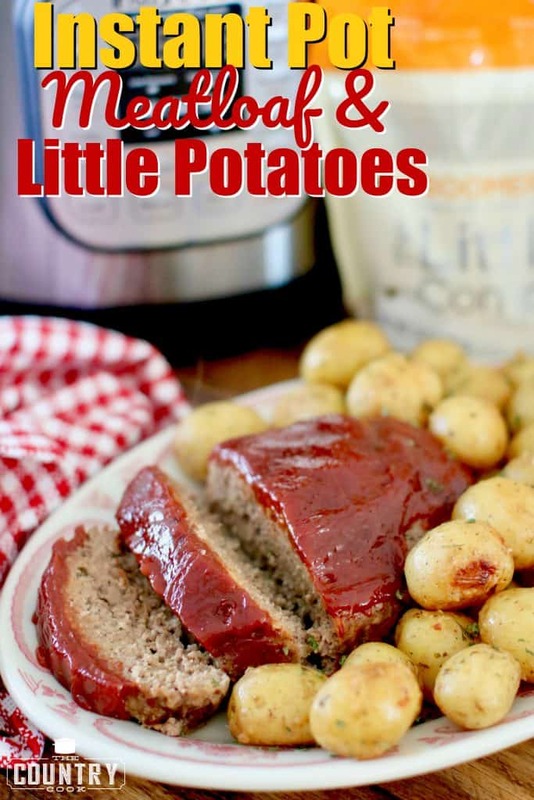 I have been working on converting some of my crock pot recipes into Instant Pot electric pressure cooker recipes. 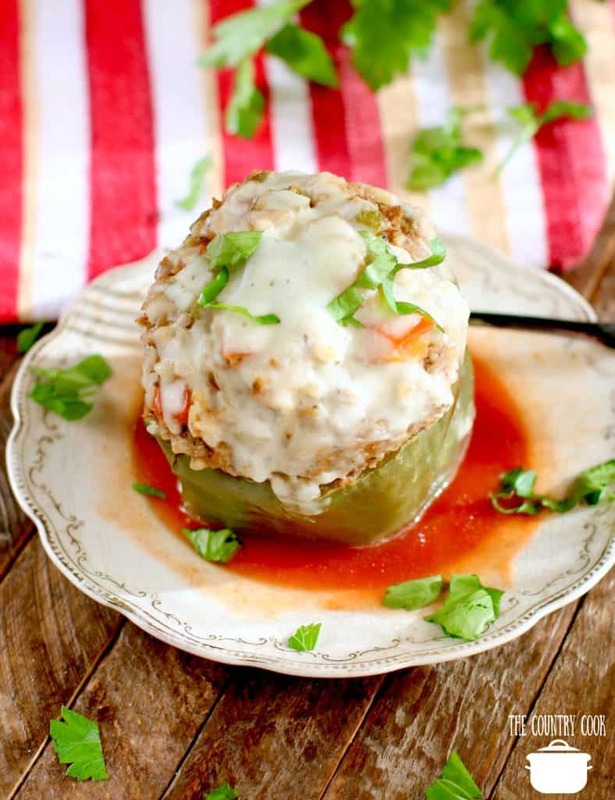 I currently have a recipe for Crock Pot Stuffed Peppers that I love. 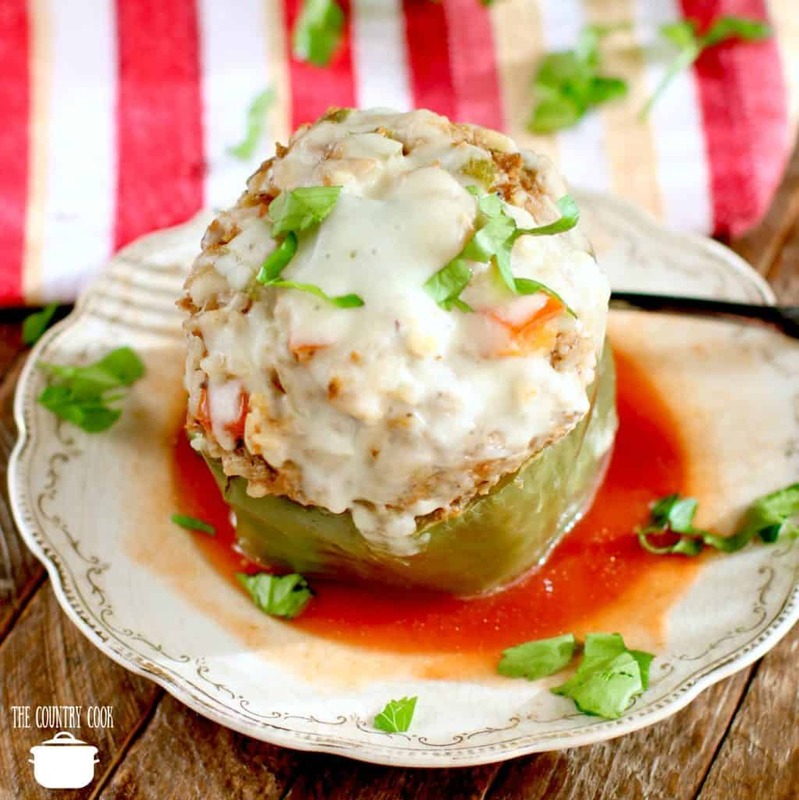 It’s a delicious twist on the usual stuffed peppers. So this time around, I thought I’d make them a bit more Italian-inspired. And it turned out so good! You don’t even have to precook the ground beef first or the rice – yay! That was one of my requirements when developing this recipe. I did not want to have to separately cook the ground beef first. I wanted this to be as painless and easy as possible. So, I used a lean ground beef so there is hardly any grease produced from this. 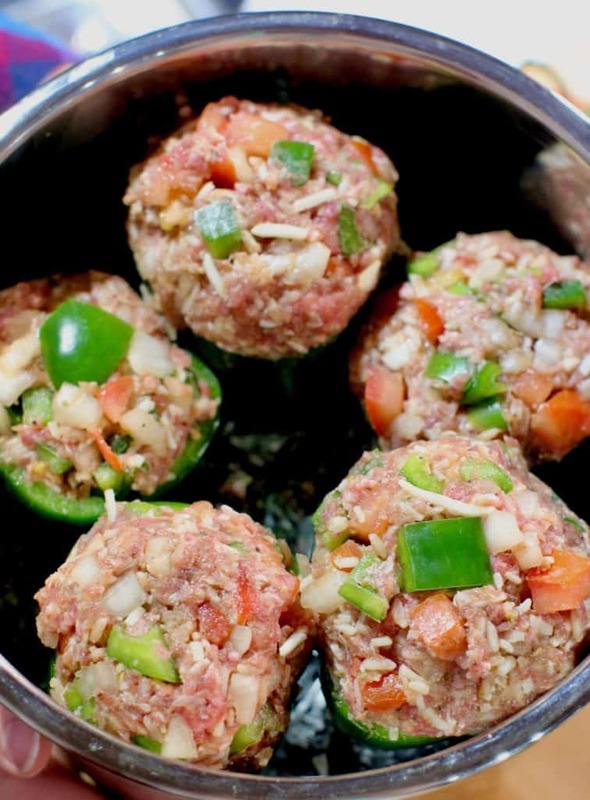 You could also use ground turkey, chicken or a lean ground pork or sausage. Top with cheddar cheese instead of mozzarella. Whatever your family loves! Slice tops off green peppers and hollow out the peppers. Mix diced peppers, onion and tomato with ground beef, egg, rice, salt, pepper, Italian seasoning, garlic powder, 1/4 cup tomato sauce and 1 cup shredded cheese. Pour 1/2 cup tomato sauce into the bottom of a 6 quart or larger Instant Pot and stir in 1/2 cup of water. Then take remaining tomato sauce left in the can and pour it on top of the stuffed peppers. 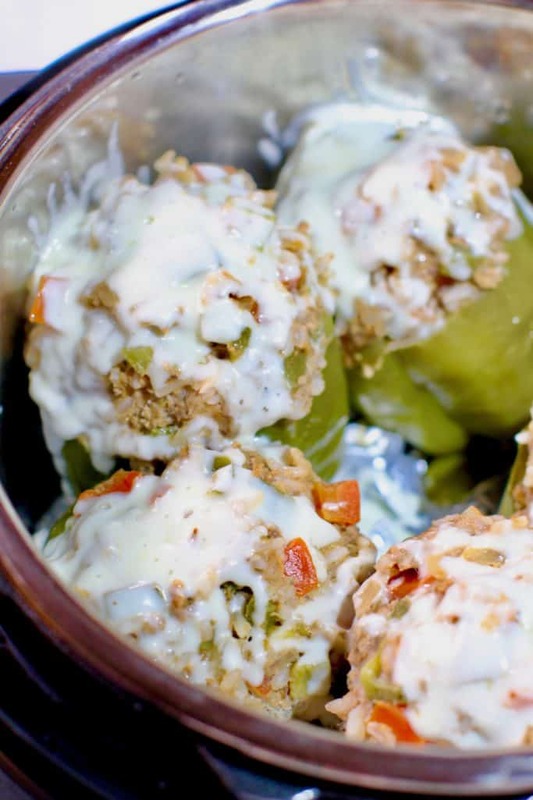 Put trivet into the Instant Pot and place stuffed peppers on top. Lock lid, making sure the nozzle is turned to “sealing” and cook on high pressure for 20 mins. 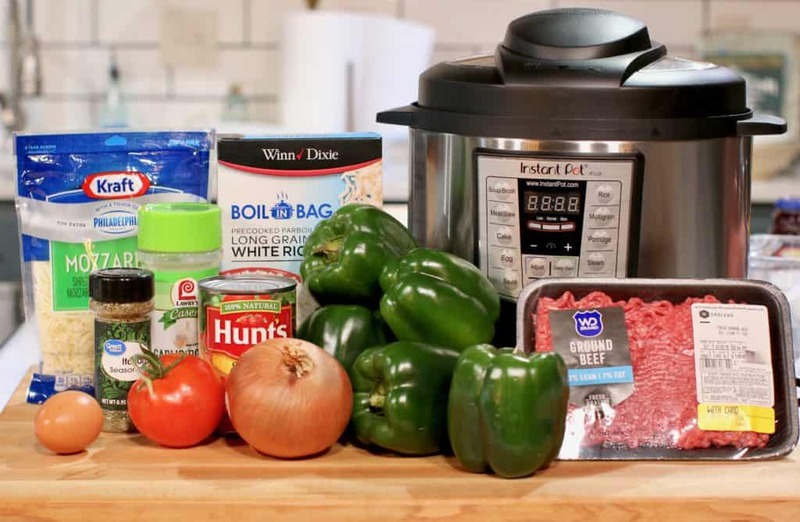 Note: It will take about 10-15 minutes for the Instant Pot to come to full pressure before cooking. 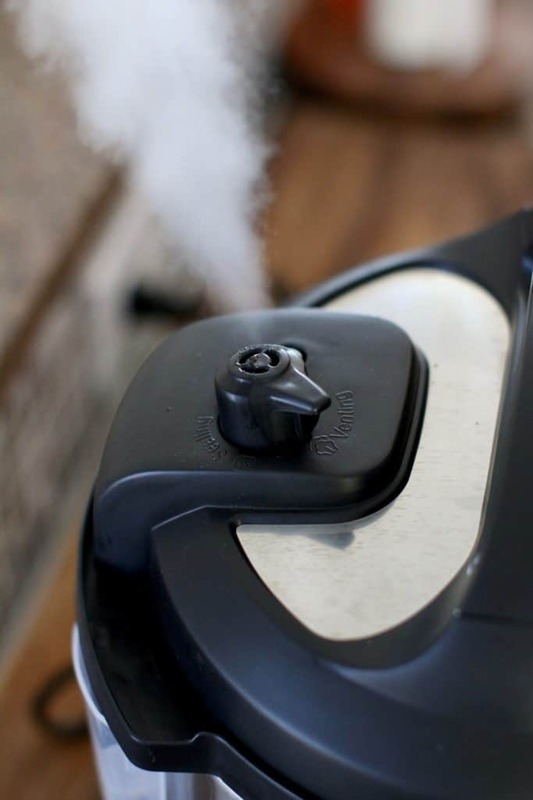 Once finished cooking, do a quick release of the pressure (be very careful, steam will come out fast and hot). Open lid and sprinkle shredded mozzarella cheese on top of each pepper. Close lid for a couple of minutes to melt cheese. 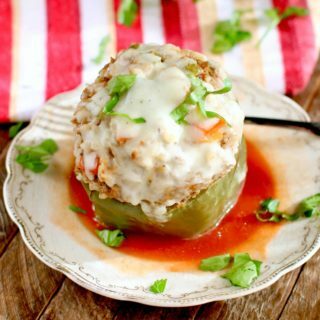 Serve stuffed peppers with some of the tomato “broth” and sprinkle with a bit of dried parsley. Mix diced peppers, onion and tomato with ground beef, egg, rice, salt, pepper, Italian seasoning, garlic powder, 1/4 cup tomato sauce and 1 cup shredded mozzarella cheese. Fill peppers evenly with meat mixture. Pour 1/2 cup tomato sauce into the bottom of a 6 quart or larger Instant Pot and stir in 1/2 cup of water. 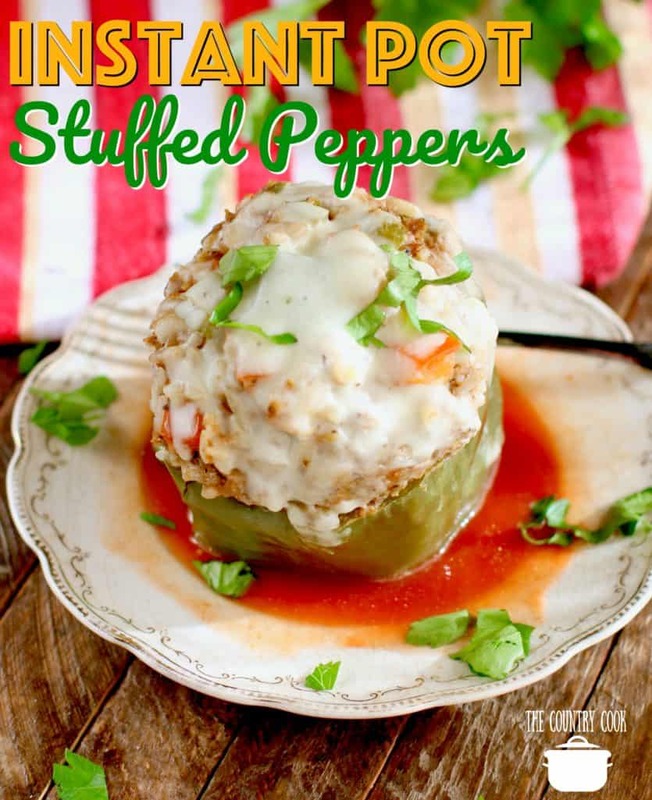 Put trivet into the Instant Pot and place stuffed peppers on top. Then take remaining tomato sauce left in the can and pour it on top of the stuffed peppers. Lock lid, making sure the nozzle is turned to “sealing” and cook on high pressure for 20 mins. Note: It will take about 10-15 minutes for the Instant Pot to come to full pressure before cooking. Open lid and sprinkle remaining cup of shredded mozzarella cheese on top of each pepper. So sweet! Thanks so much Debbie!! I also like the boil in bag rice. The bag of rice is just opened and added to the recipe? Hi Rose! Yes, that is correct! Can this be made in a crock pot slow cooker? What if I don’t have boil in a bag rice? Can I just use regular rice? Do I need to cook it first? And how much should I use? Thanks! What size IP did you use? I couldn’t fit 5 in my 6 at….. The package of rice has 4 individual bags. I followed the recipe and these were delicious! 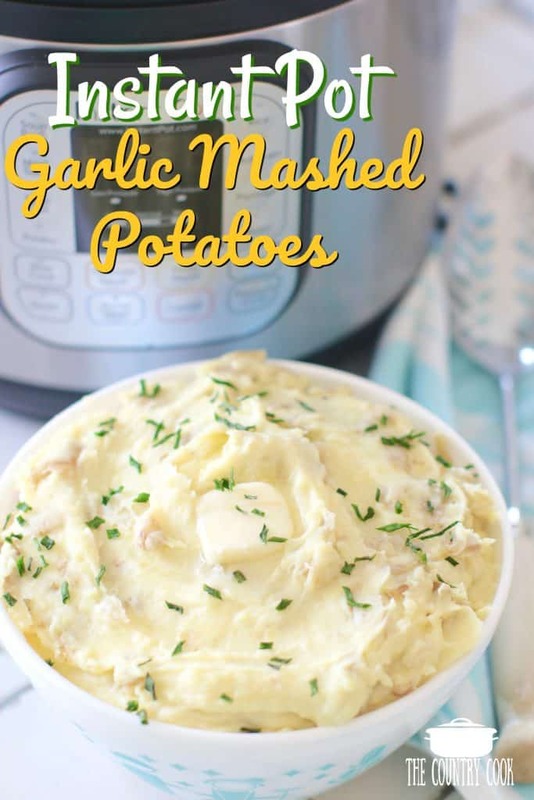 I have been looking for more one pot meals that are easy and quick with the instant pot and I’ll definitely make this again! Can’t believe it takes out all the steps of boiling the peppers, browning the meat, cooking the rice, etc and lets you do it all in one. I love this recipe. Made one with a th Turkey. Absolutely delicious. Using sausage today. Bu th was wondering should my pressure time be longer with the raw ground sausage? Enjoying your recipes. I am an instant pig newbie. I made the stuffed peppers, Absolutely delicious. Will make it again!! I’m really looking forward to making this recipe. However, I have a question. Some boxes of boil in bag rice have 2 pouches, some have 4 pouches. Which size do I use? I am fairly new to Instant Pot cooking. (In fact my brand is Yedi) It is made by Instant Pot manufacturer ,I believe. That said, I am very happy with it & have had no problems using it. I just finished fixing your Italian Stuffed Peppers. They are delicious! My husband enjoyed them too! I will definitely make them again. Thank you so much for the recipe. I am sure I will be making more of your recipes in the future. Hi Gloria!! This is so awesome to hear. I actually love hearing how recipes turn out with different brand pressure cookers. It can help others too. Thanks so much! Hi Gloria! Thank you so much for coming back and taking the time to comment! This really made my day to hear. 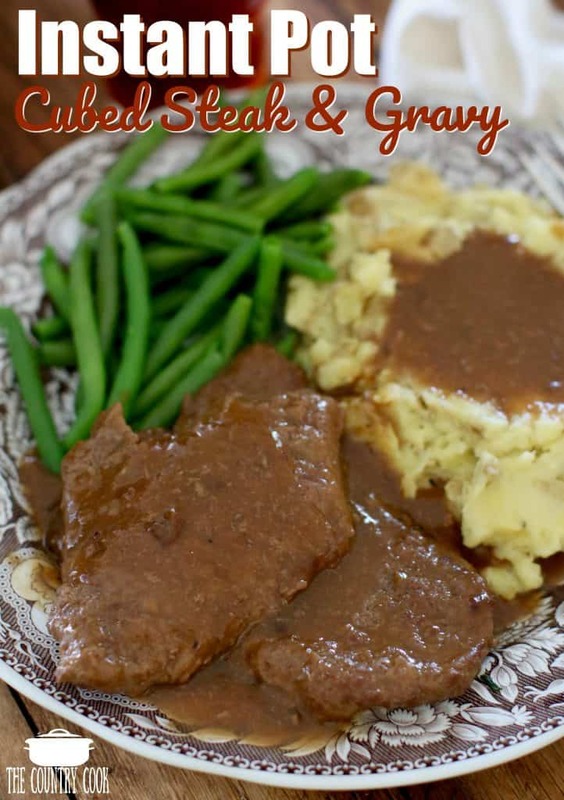 I am so thrilled you love this recipe – yay!